Bobby Keys, best known for his sax work on The Rolling Stones’ Exile on Main Street and Stones concert tours of that era, has died at 70 of cirrhosis. My favorite Keys memories involve countless rants from my close personal friend and founding Townsman E. Pluribus Gergely. Somewhere in the archives there’s probably an entire thread built around one of EPG’s Keys rants, but a taste of his thoughts on the man are available in this old thread. Track 5, specifically, cites Keys’ work. 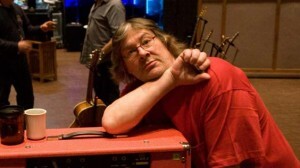 What’s your favorite Bobby Keys moment? “Early Stones,” or Jeez, I’m Old! While flipping the radio dial between sport-talk radio ads on my ride home from work last week I landed on the opening measures of one of the most perfect (and perfect-sounding) songs in my world: “Beast of Burden,” by The Rolling Stones. The coming updates on the Eagles’ (my hometown football team, not the band) bye week, following the commercial break, could wait. I had to listen to this soulful gem all the way through! First, I felt like the DJ was an idiot. Then, I felt like I was 100 years old. Finally, considering the Stones have survived 36 years since that album, it could technically be considered a song from their “early” period. Put me up front with those teenybopper girls. This is my Rolling Stones. This is the reason rock ‘n roll was invented to serve youth culture. This is the reason we start bands. Find me one Mick Taylor-era performance that has half this clip’s unity and energy. Let’s play Rock ‘n Roll General Managers, shall we? You are the GM of The Beatles or The Rolling Stones. Your mission is to put together a trade with your respected and beloved rival band that benefits both bands. It can be a one-for-one trade or a multi-musician deal. The bands can even trade trademark songs. As Rock ‘n Roll Fantasy League Commissioner, I may even approve a 3-band deal, involving personnel from one of the other big British Invasion bands. My role in these decisions, of course, will be guided by the Best Interests of the Game. Although longtime friendly rivals, The Beatles and The Stones do not have a long record of musician transactions. The lads from Liverpool did help launch the career of the the scruffy London upstarts by dealing them “I Wanna Be Your Man” to for future considerations. John Lennon and Keith Richard barnstormed in The Dirty Mac. 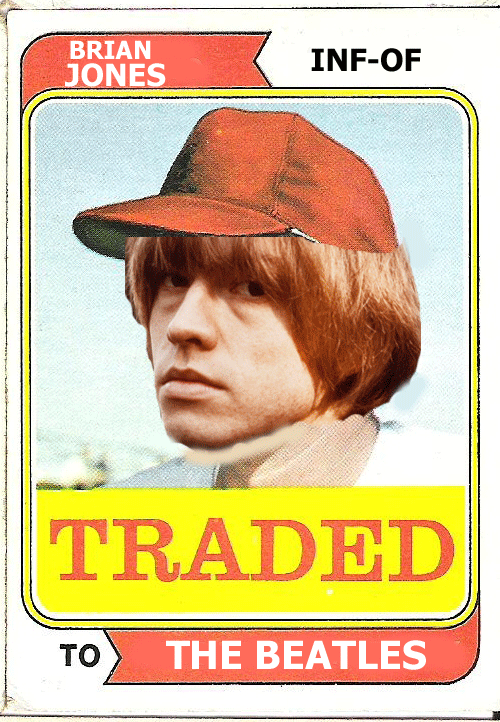 Brian Jones took batting practice with The Beatles’ on a silly B-side. Art dealer Robert Fraser shows up in the biographies of both bands. I believe a young American photographer named Linda Eastman was scouted by The Stones before landing in Paul McCartney’s pad. Billy Preston is probably the one musician closely identified with both bands. Therefore, Preston is NOT eligible for any trade between these bands. Regarding another man closely identified with both bands, The Stones have already declared “No trade-backs!” on Allen Klein. Stones’ GMs may trade from their band’s full array of “other” guitarists along with dedicated sidemen, like Ian Stewart and Bobby Keys. Stones’ wives and longtime lovers are not untouchable. Even outright hangers-on, such as drug dealer “Spanish Tony” Sanchez, are in play. Likewise, Beatles’ GMs may select from their deep roster of engineers, sidemen, wives, hangers-on, and hagiographers. Let the trade talks begin! The Oldest Story in the Book of Rock? 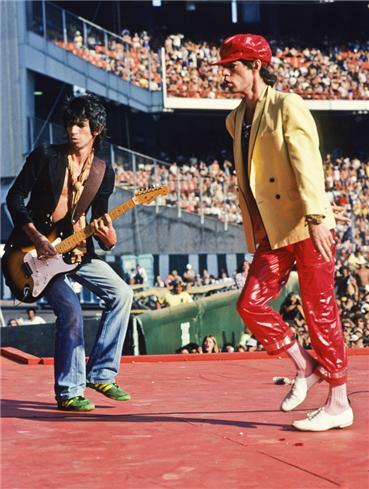 A recent Rolling Stone feature on The Rolling Stones featured the 8,456,201st telling of what may be the oldest story in the book of rock: the rapprochement of the Glimmer Twins, Mick Jagger and Keith Richards. In my rock magazine-reading lifetime, these articles date back to the release of Some Girls. I wouldn’t be surprised if this story extends back a few album releases/tours earlier. The reasons for the divide shift slightly from personal/artistic- to personal/business-rooted interests as the years pass, but the narrative always drives at the same conclusions: Divided, the Stones give us the New Barbarians/X-Pensive Winos and Mick Jagger solo albums; united, the treat us to another greatest hits package, a world tour, and whatever new dirt can be scraped from surviving band members’ yellowing fingernails. For this, we give thanks and praise. Is there an older, more frequently told story in rock than the rapprochement of Keef and Mick, and all the mixed emotions their union represents to rock’s core values? He was a Great Man who engineered Exile on Main Street, The Greatest Record Ever Made. I came over here in 1970, because I was working with Jimmy Miller and he was an American who had a production company out here. The studios were a little behind the times, though. When I was mixing “Stairway to Heaven” over at Sunset Sound and I wanted to pan something, I said, “You don’t have pan pots on the channels.” They responded, “We have a pan pot. Bring on the pan pot!” They bring out this guy on a gurney, you know? A big box with a huge knob, a pan pot man. Christ, the Americans sent someone to the moon, but they only had one pan pot. It was like having one meatball. You can have all the bread you want, but only with one meatball.